To prepare the batter for the Oreos™, mix together the flour, baking powder, salt, and confectioners' sugar in a medium bowl. Put the 5 ice cubes in a glass measuring cup and add enough seltzer to make 2 cups. Add to the flour mixture along with the egg yolk. Mix until there are no large lumps and the ice cubes have melted. Set aside. Fill a tall saucepan or deep-fryer with up to 2 inches of vegetable shortening and heat to 350° F . Dip the Oreos™in the batter and fry a few at a time until crispy, 45 to 60 seconds. Carefully remove with a slotted spoon and drain on paper towels. 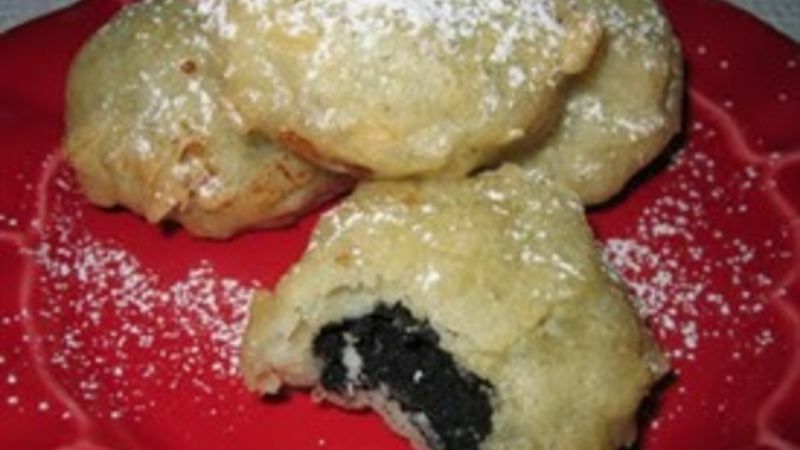 Continue until all the Oreos™have been batter-dipped and fried.